The United States has 59 national parks. The national parks are protected areas operated by the National Park Service. Below is a list of the 10 most visited national parks in 2012. 1. Great Smoky Mountains National Park – 9 million visitors. With more than 9 million visitors per year, the Great Smoky Mountains national park is the most visited national park in the united states by far, and one of the most popular attractions in the US in general. The park is located in the states of Tennessee and North Carolina and was established in 1934. This UNESCO world heritage site is home to over than 400 vertebrate species, 100 tree species, and 5000 plant species. The main attraction of the park is hiking, offering over 800 miles (1,300 km) of trails. 2. 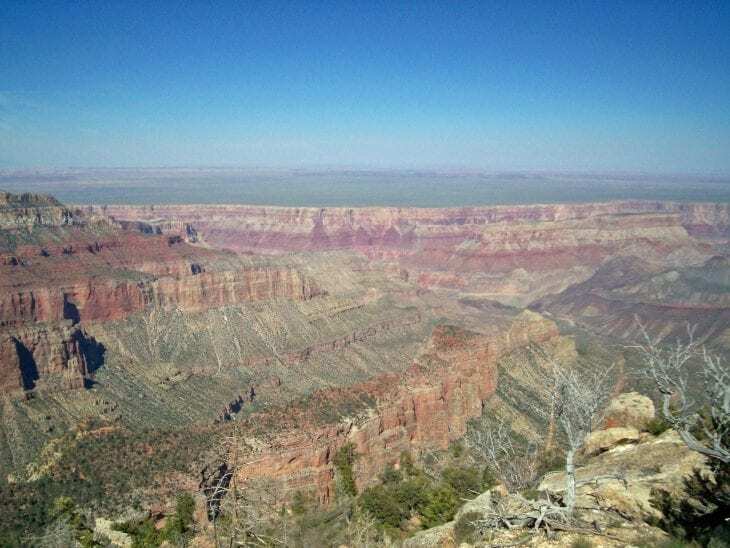 Grand Canyon National Park – 4.3 million visitors. The Grand Canyon, the most famous canyon in the world, was established as a national park as early as 1919. This amazing canyon is 277 miles (446 km) long, reaches a mile (1.6 km) in depth, and up to 15 miles (24 km) wide. It was carved by the Colorado River over a period of millions of years. The park is located in the state of Arizona and was declared as a UNESCO World Heritage Site in 1979. 3. Yosemite National Park – 3.8 million visitors. Yosemite was established as a national park in 1890 – making it the third oldest national park after Yellowstone and Sequoia. Located in the state of California, Yosemite is also a UNESCO heritage site, and contains beautiful cliffs, waterfalls (Yosemite Falls are North America’s tallest waterfall), three Giant Sequoia groves and diverse wildlife. 4. Yellowstone National Park – 3.4 million visitors. Yellowstone national park was the first national park. It was established in 1872 and is divided between the states of Wyoming, Montana and Idaho. This UNESCO heritage site has vast geothermal areas with many hot springs and geysers. The Yellowstone River runs through the park with several waterfalls, along with 4 mountain ranges. The park is well known for its wildlife that include almost 60 mammal species, such as the gray wolf, grizzly bear, bison, lynx and elk. 5. Rocky Mountain National Park – 3.2 million visitors. Established in 1915, this wonderful national park is located in the state of Colorado. The park contains a section of the Rocky Mountains that contains many lakes and forests that are inhabited by lots of wildlife including mule deer, bighorn sheep, black bears, and cougars. 6. Olympic National Park – 3 million visitors. This 922,650.86 acres in Washington state was established in 1938 and declared a UNESCO world heritage site in 1981. The park contains both a Pacific shoreline and temperate rainforests, as well as Mount Olympus. The area is known to be the wettest area of the continental United States. 7. Zion National Park – 2.8 million visitors. Located in Utah, this national park features colorful sandstone canyons, high plateaus, and natural rock towers and arches. The park is also home to “The Narrows” – a popular hike that was rated #5 in the National Geographic ranking of America’s Best 100 Adventures. The hike is 16 miles (26 kilometers) long, most of which is done by walking within the Virgin River. 8. Grand Teton National Park – 2.7 million visitors. Grand Teton park in the state of Wyoming was established as a national park in 1929. Grand Teton mountain is located within the park’s boundaries and is the tallest mountain in the Teton Range. In addition to the tall mountains, the park contains beautiful valleys and lakes. 9. Acadia National Park – 2.4 million visitors. Located in Maine, Acadia has been a national park since 1919. The parks include most of Mount Desert Island as well as other coastal islands. Acadia national park features the tallest mountain on the Atlantic coast, impressive granite peaks, shorelines, woodlands and freshwater lakes. 10. Cuyahoga Valley National Park – 2.1 million visitors. Established as a national park only in 2000, Cuyahoga Valley in Ohio has already accumulated a large number of visitors each year. This park features waterfalls and hills with hiking trails, and has numerous historic homes, bridges, and structures that help understand the early rural living.